Apple Watch Series 3 42MM. Color: Fog (Gray). Unlocked GSM 4G LTE cellular function. We work hard to provide the best product for you. Increase productivity and reach your fitness goals with the Apple Watch Series 3 42-millimeter smartwatch. This device's sleek design features a silver aluminum case and fog sport band made of fluoroelastomer. Running on Apple Watch OS, this smartwatch offers cellular connectivity for the included accelerometer, altimeter, and gyroscope. You can also receive notifications, access apps, stream music, and charge your watch wirelessly. This unlocked watch acts as a personal assistant, trainer, and entertainer all in one package. item 1 Inbox New Apple Watch Series 3 42MM GPS - Cellular Silver Case & Fog Sport Band. -Inbox New Apple Watch Series 3 42MM GPS - Cellular Silver Case & Fog Sport Band. Very very pleased. & so happy with the watch! 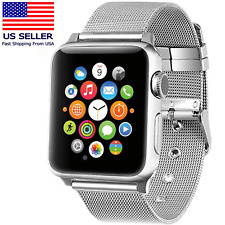 I was skeptical at first buying an Apple Watch on eBay, I but a lot of things on eBay but something like this I usually try to get it from a store because I like to make sure any electronic I buy is in really great shape before I buy it. I wanted to buy one from Best Buy but I really didn’t want to pay over 400$. when I saw this watch on eBay I was really happy with the price and it seemed like this seller was trust worthy.. so I purchased one & once my watch got to me I couldn’t have been anymore pleased. It was in perfect condition, in the original box, & it was easy to set up. I connected to cellular easily, (I use sprint) & for the price I payed it was totally worth it and I received it within 2 days. 10 out of 10. So I ordered this apple watch series 3 because I couldn't afford the almost 300 dollar brand new version. This was worth the money, with only a few slightly noticeable scratches on the screen. But it came as described. Very satisfied. I found this watch on eBay, I've been looking for a great deal for afew months and finally found it here. Love my watch, especially the cellphone part. Watch was in perfect condition. No defects or blemishes. Only issue was the warranty from Apple started on the day the product was initially purchased so the Apple warranty will expire on December 21, 2018 which is only 6 months instead of 12 months and can’t purchase AppleCare when product is more than 30 days old. REally Happy with the Apple watch 3. I had the 2 and liked it also, but wanted the bigger 42mm and chickened out on the 2, as I thought the 42 was for Men. Nope it is for me.